BirdCagePortal.com - Pet Bird Supplies, Parrot Supplies, Cages & Bird Products - GFBSMD - Bean Supreme - 64 oz. GFBSMD - Bean Supreme - 64 oz. Goldenfeast Bean Supreme - 23 oz. for medium and large birds. 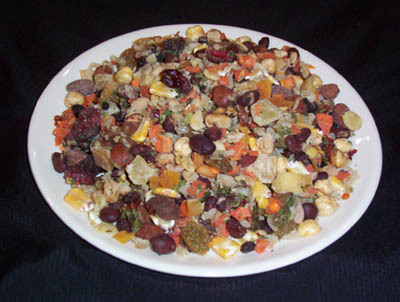 Ingredients: Instant brown basmati rice, dry roasted soybeans, rolled corn, dehydrated carrots, dehydrated cranberries, cooked dehydrated pinto beans, roasted unsalted almond pieces, cooked dehydrated navy beans, dehydrated sweet potatoes, cooked dehydrated red beans, jumbo flame dehydrated white grapes, cooked dehydrated chic peas, dehydrated spinach, dehydrated celery, diced dehydrated pineapple, cooked dehydrated black beans, orange lentils, diced dehydrated mango, cooked dehydrated lima beans, sun dried tomatoes, dehydrated sweet peppers, non-roasted shelled walnuts and non-roasted shelled filberts. Guaranteed Analysis: Crude Protein (min.) 16.5%; Crude Fat (min.) 10%; Crude fiber (max.) 9%; Moisture (max.) 4%; Ash (max.) 8%. Serving Instructions: Serve Dry (or) "Instant Cooked" following our easy preparation recipe: Simply boil 1½c of water and add to 2c of formula. Stir and let sit until food is moist and cool, approximately 40 minutes. Stir again and serve. Remainder can be refrigerated for up to 4 days (or) freeze remainder in ready.